So The Best Honey Baked Christmas Ham Ever probably sounds like a big claim, and I take the gravity of that statement very seriously. 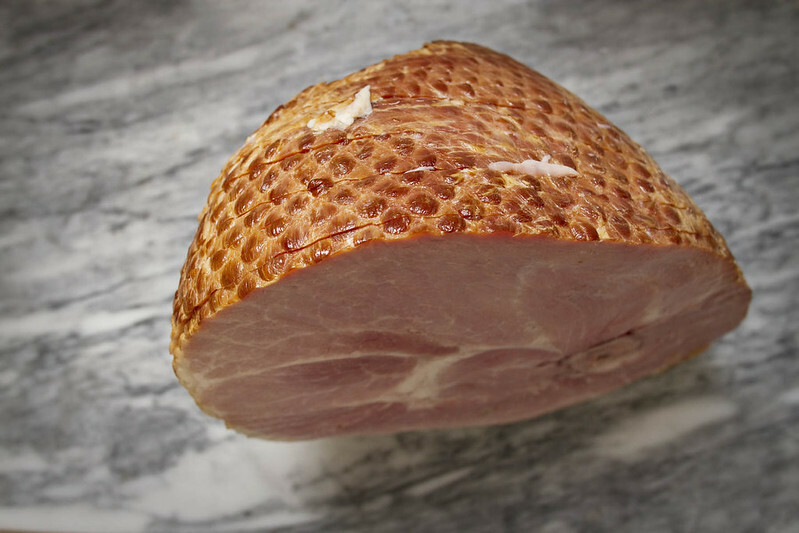 I know that ham is important, crucial to Christmas and Easter celebrations, sweet and crisp outside, moist and juicy inside, I know claiming to have produced the best honey baked ham recipe ever is a heady claim, but I swear this ham lives up to it. In Cleveland, where I spent my childhood, holidays like Christmas and Easter require ham. It's as essential as the baby jesus in the nativity scene at Christmas, as ubiquitous as chocolate eggs at Easter. New Years Eve? Ham. Graduation party? Ham. Baby Shower? Better make it a ham. 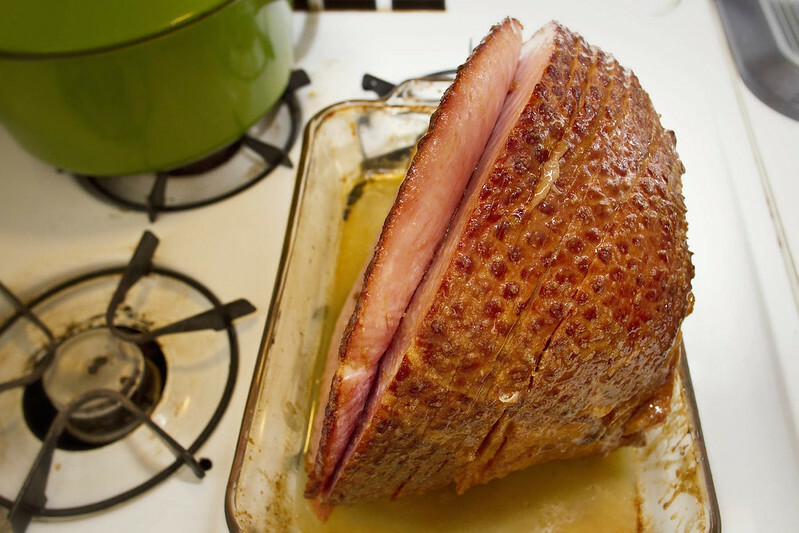 Ham is the king of holiday foods in Cleveland, and the king of holiday hams is Honey Baked Ham. If you don't know (S didn't), Honey Baked Ham is a franchise of shops that specialize in smoked, sweet honey glazed hams. Around the holidays in Cleveland if you want one of these hams you better order it in advance, and be prepared to wait in a line that exits the shop and wraps around the block. People wait upwards of an hour in the cold Cleveland winter weather to procure one of these hams. They are hunks of spiral cut goodness. When I first set out to make a Honey Baked Ham copycat I did not have faith that I could produce something as delicious as the original. Surely the illustrious master of ham who creates their recipes must have some secret tricks up his sleeve. 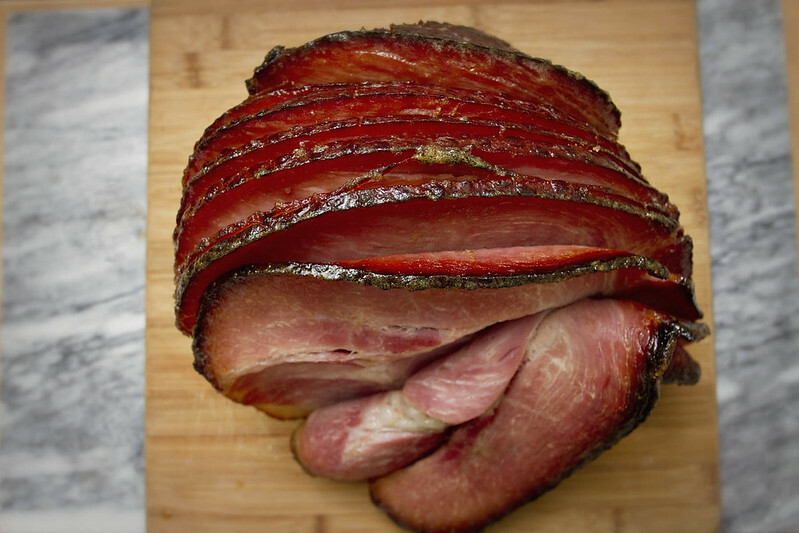 In the end though, it turned out remarkably simple to make a ham that not only tastes like Honey Baked Ham, it actually tastes BETTER than Honey Baked Ham. I settled for an 8.5lb ham and we had six people to dinner. I read online ahead of time to figure about 1/2lb meat per person eating, but six of us ate practically every bite of that 8.5lb ham! I had just enough leftover to make ham mac'n'cheese later in the week. One friend was so in love with this ham she expressed a desire to tear chunks of it from the bone with her bare hands. 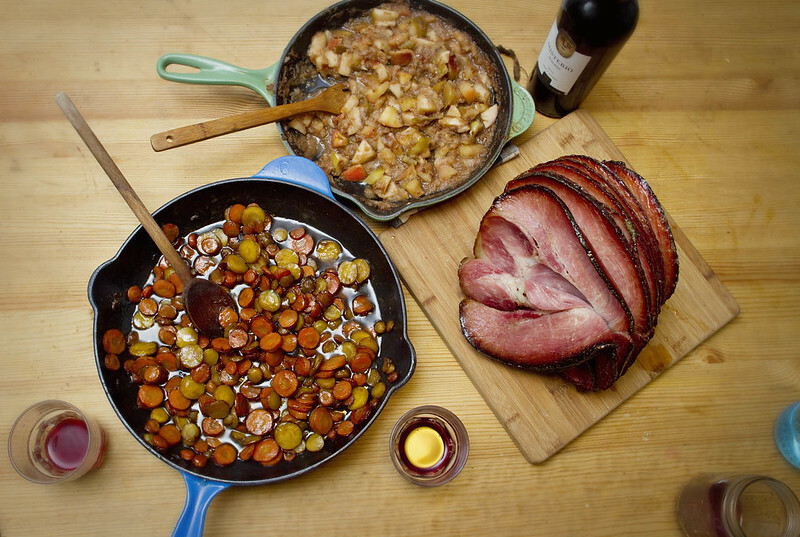 The fruit juice soaks in during the first cooking stage imbuing the ham with a sweet, lightly tangy flavor, and the brown sugar-honey glaze forms a crisp caramelized rind almost reminiscent of candied bacon. 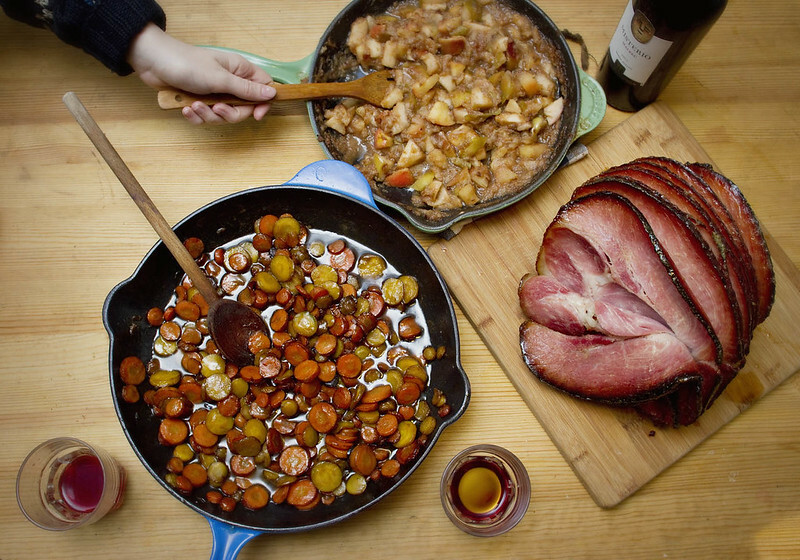 Whether you make this ham (and you should), or not, may your holidays be jolly, bright, and full of delicious foods! In a bowl mix the orange and pear juices with 2/3 C pineapple juice. 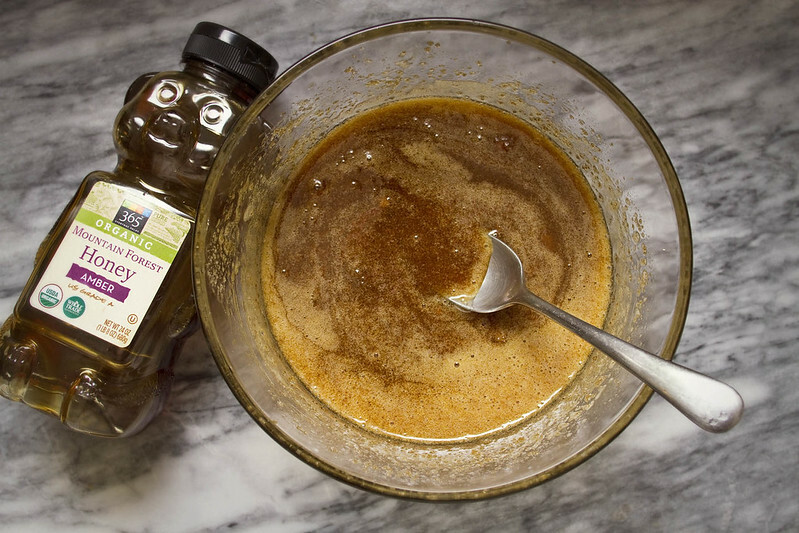 In another bowl mix the brown sugar, honey, and remaining 1/3 C pineapple juice together. Place ham in roasting pan cut side down and baste well with the pineapple/pear/orange juice combo. Place in oven and cook 30 minutes, basting with the fruit juices every 5 minutes. After 30 minutes baste the ham heavily with the brown sugar/honey/juice combination, and continue roasting, basting with the brown sugar glaze every 15 minutes, until ham reaches 165 degrees in center, for my 8.5lb ham this took about 1.5 hours. Today I bring you one fantastic syrup, and two holiday cocktails. Three recipes in one! Not to mention the virgin cinnamon lemonades you can make with this. Especially sparkling cinnamon lemonades. I love sparkling beverages. S and I were early adapters to the whole Soda Stream craze, and we're still pretty in love with ours several years later. Before we even got it, when we were browsing online, I knew there was no way I was using those pre-fab syrups it comes with. Not when there was basil-lime soda, or ginger-tangerine Orangina's to be made! December in New York is difficult. You want to go Christmas shopping and look at the decorations and feel festive, but it's really cold, and there's this slushy sleet falling from the sky pooling all over the sidewalk and it's a wet, cold experience. 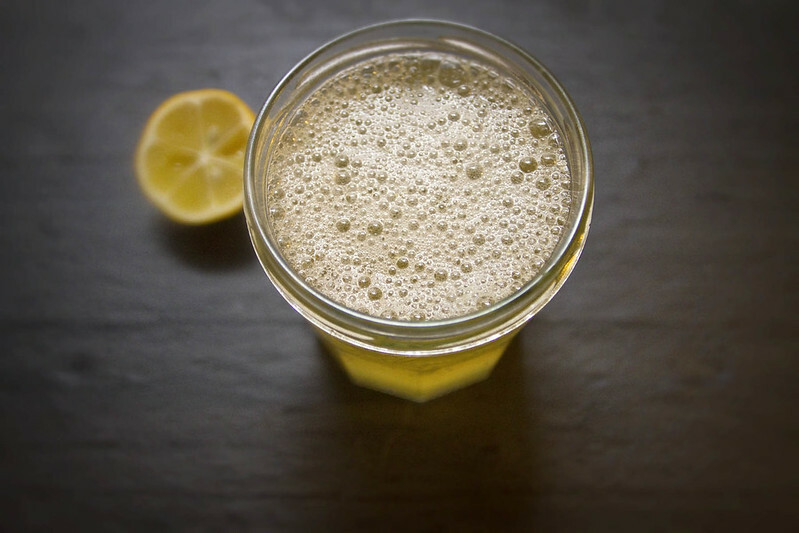 However, it's also the beginning of citrus season, and a bite of a delightful orange or a fresh glass of lemonade goes a long way in making me forget it's sleeting, again. 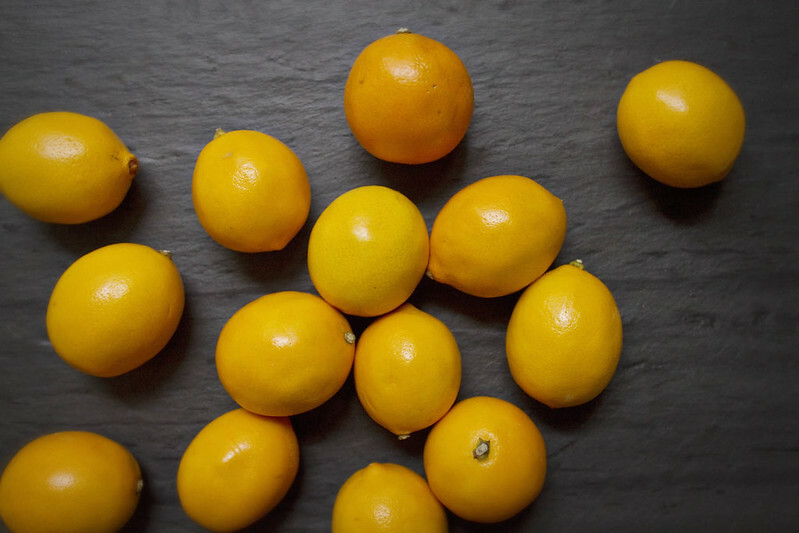 Meyer Lemons rank amongst my favorite citrus fruits, they're a sweeter, softer skinned variety of lemons that are so sweet and delightful you can even eat them plain. 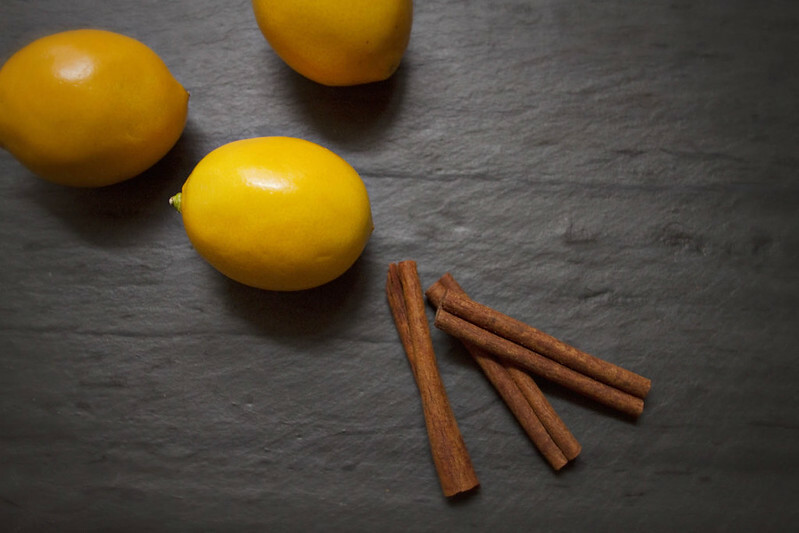 An interesting fruit, they were killed off in the 1940s and revived in the 1970s as the Improved Meyer Lemon. In the past I've made a Meyer Lemon Olive Oil Cake, which was great. And I've made lemonade with them many times, and once a cake covered in candied meyer lemon slices. So when I saw a 2lb box of meyer lemons at Fairway last weekend I grabbed it immediately. There is a restaurant near our apartment called Peels which serves an incredible cinnamon lemonade which S and I tried on the recommendation of two preteen girls I know. 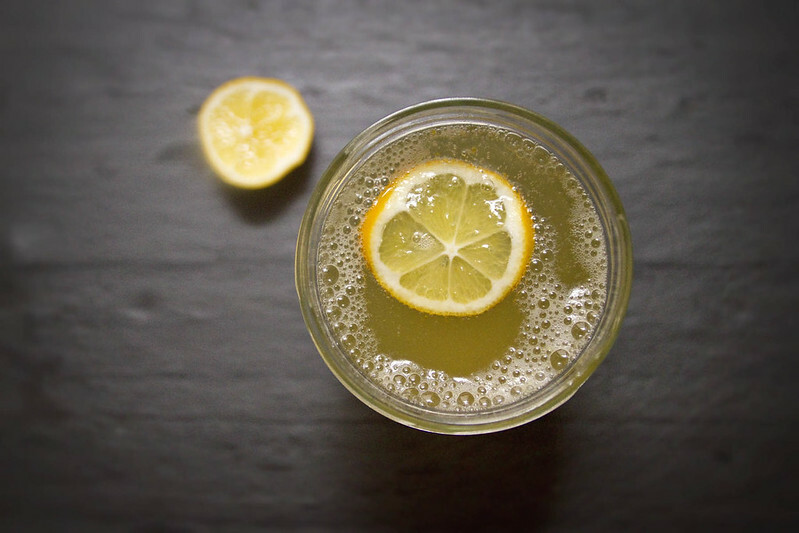 These drinks are a grown up version of that lemonade. 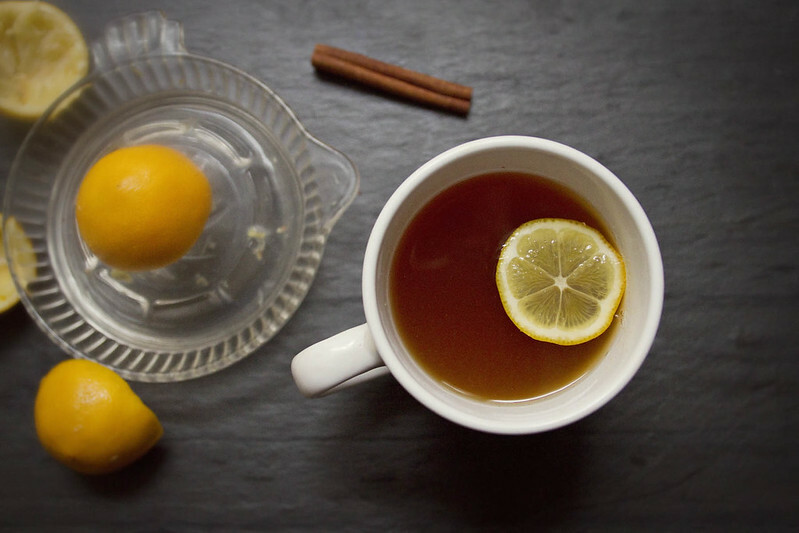 The hot toddy is complex, rich and inviting, perfect for warming up after sledding or some holiday caroling. It would be fantastic out of a thermos slope side after a day of skiing. Not that I'm suggesting you drink in public. Often. 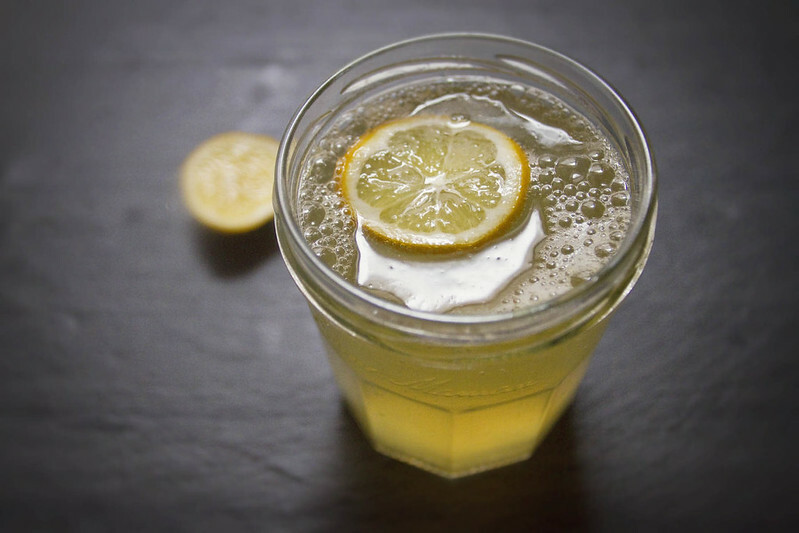 The Cinnamon Snowbird is a fizzy cinnamon tinged whiskey lemonade. The whiskey is wintery and warming, the cinnamon definitely adds a clear note of Holiday! and the lemon is like a warming beam of sunlight on a snowy day. I couldn't resist adding seltzer. Sparkling cocktails are my favorite. This would be a fantastic drink for a Christmas cocktail soiree, or a New Years Ever bash. It's easy drinking and not too stiff (though feel free to add as much extra whiskey as you want), with a festive cinnamon note and a bright zippy citrus flavor. Enjoy! Combine water, zest, and sugar in a saucepan and heat over medium-low until all sugar has dissolved. 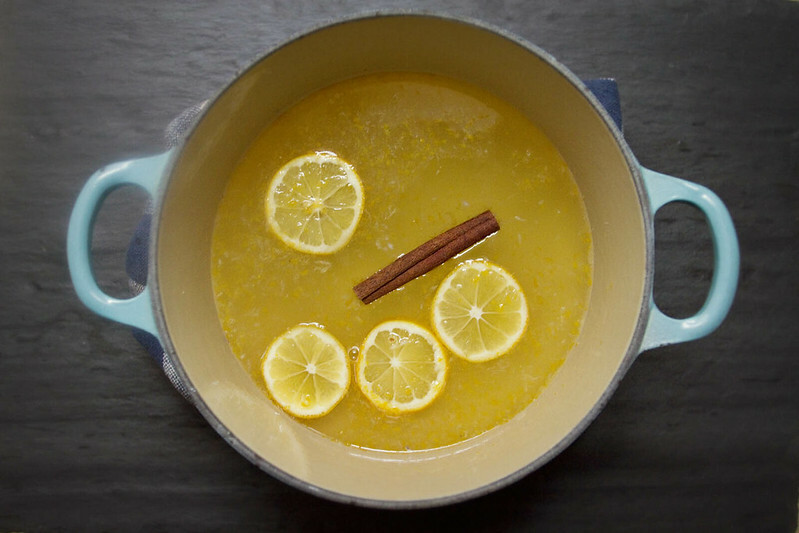 Once sugar has dissolved add the cinnamon stick, lemon juice, and if you're using them, add the lemon slices. Bring to a boil then reduce to a simmer and cook for about 10-12 minutes. Taste it occasionally, it should be pretty strong, since it'll be watered down in your drink. 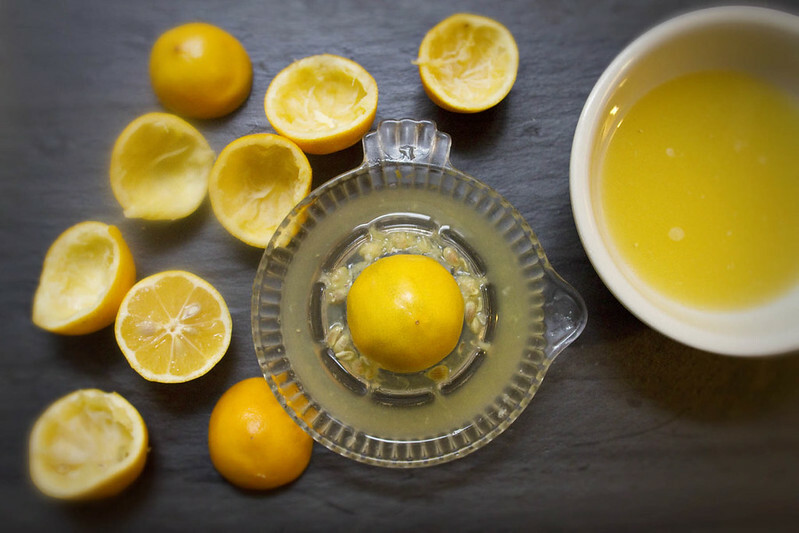 After cooking 10-12 minutes, remove from heat and strain syrup through a fine sieve to remove lemon pulp. Eat the lemon slices, they're candied now! Store in a jar and use to make the cocktails listed below, or a sparkling lemonade. Gather four tumblers or mason jars, and pour 1.5 oz whiskey into each. Add 2 oz Meyer Lemon Syrup per glass, then top with seltzer. Float a slice of lemon or bit of cinnamon stick on top for garnish. 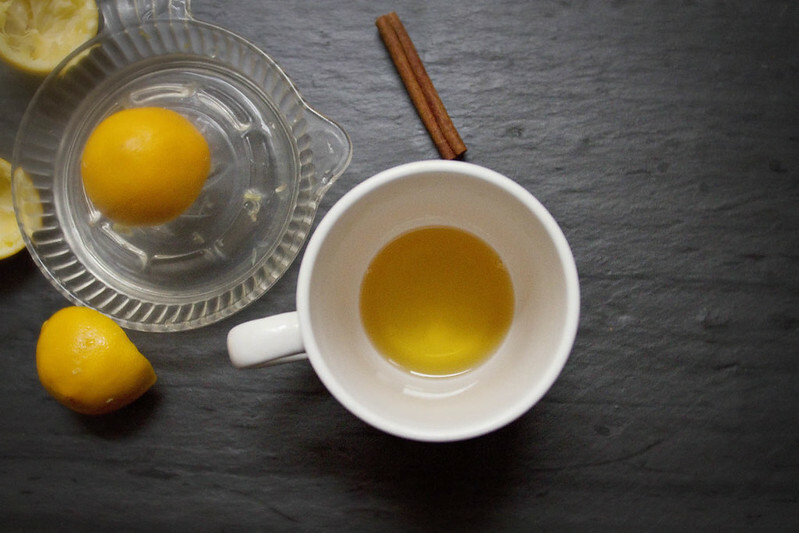 Add 1.5 oz (1 shot) Whiskey and 1.5 oz Meyer Lemon Cinnamon Syrup to each mug, add 5 oz hot black tea, and garnish with thinly sliced lemon, if you like. 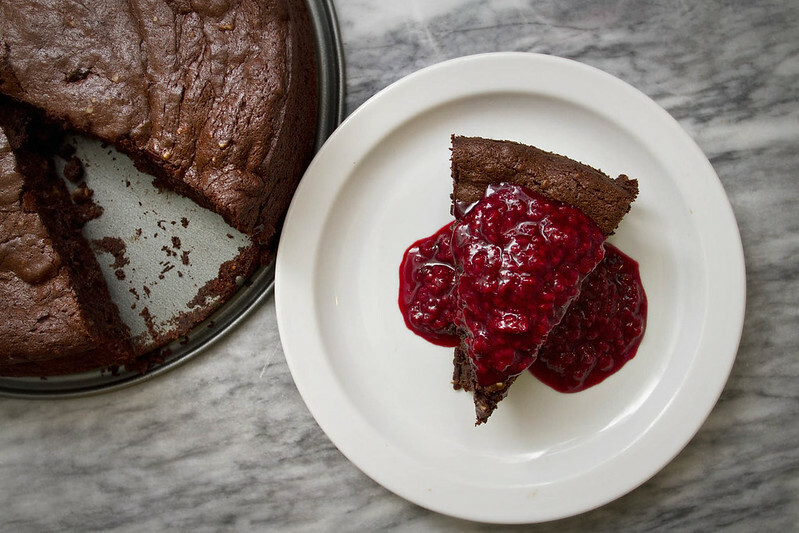 Flourless chocolate cakes have always had a high ranking amongst my favorite desserts. I know they're not very high brow, but I'm a sucker for melty chocolate and moist cake. 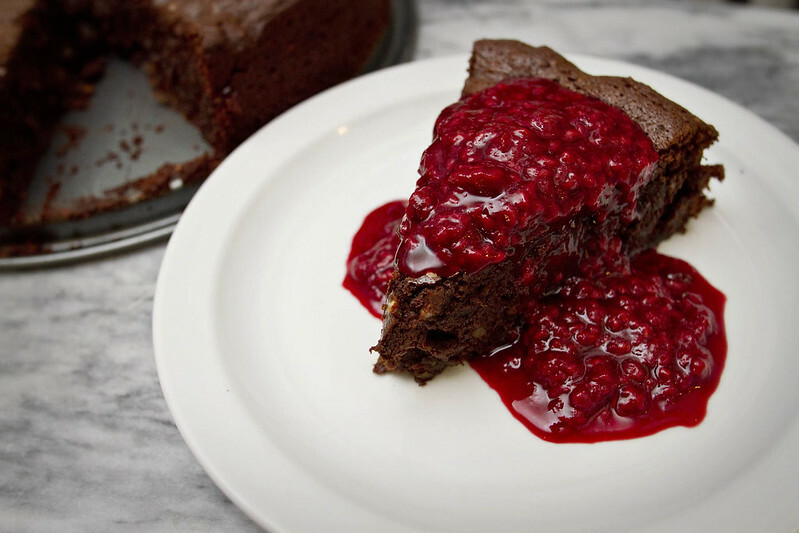 There is a restaurant in Cleveland that serves a "pate" of soft chocolate ganache covered in raspberry sauce that was pretty revelatory to me as a child, and probably shaped a lot of my future dessert aspirations. I also love date cake. 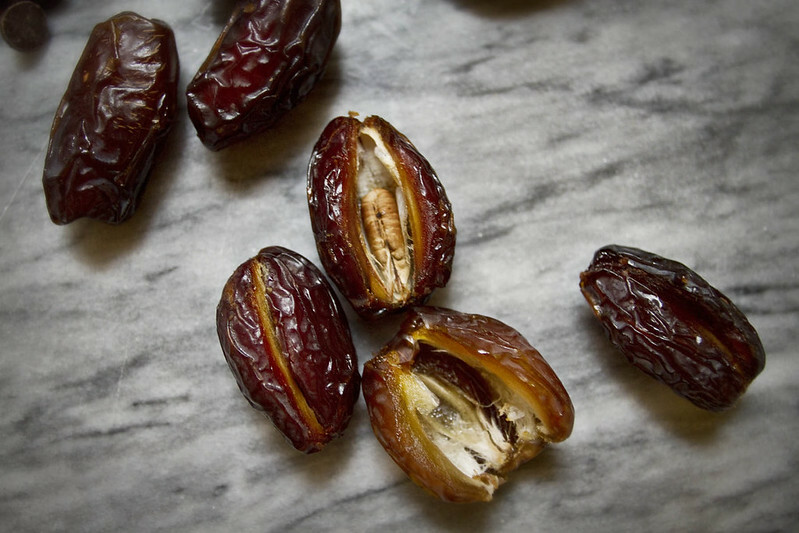 Sticky and dense and heavy, I love the way baked dates taste like caramel or browned butter. A friend recently told me she didn't encounter dates until she was an adult. The first time she heard of them was on a restaurant menu, in the form of Date Cake. She thought it was a special cake meant to be served on dates! Like, romantic dates, not the fruit. She and her dining partner ordered it and made all sorts of jokes about eating the special date cake, until her girlfriend arrived and informed them dates are, in fact, a fruit. However, I highly recommend you serve this cake on date night because I'm pretty sure S started loving me more after he tried this cake. It is that good. I finished shooting it just before he got home so as soon as he took off his shoes and sat down we split the first slice and it was amazing. "I had a really hard time with that date cake today." As if it has misbehaved or been in his way. "I had a hard time not eating it." He said. 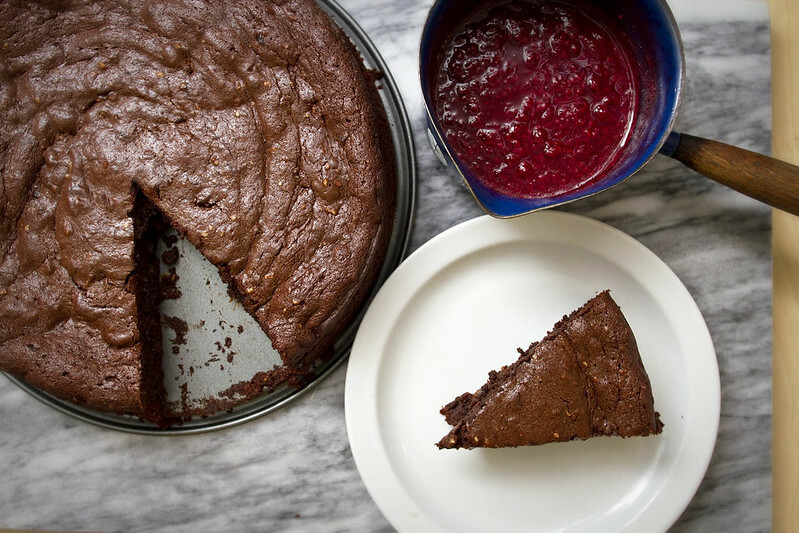 It's an adaptation of this recipe, I tweaked the amount of dates, changed some sweeteners, swapped brown sugar for the more caramel tasting coconut sugar to match the dates, added maple syrup, cinnamon, and almond extract and the result is a complex, dense but not heavy, chocolatey cake with a heavenly texture. 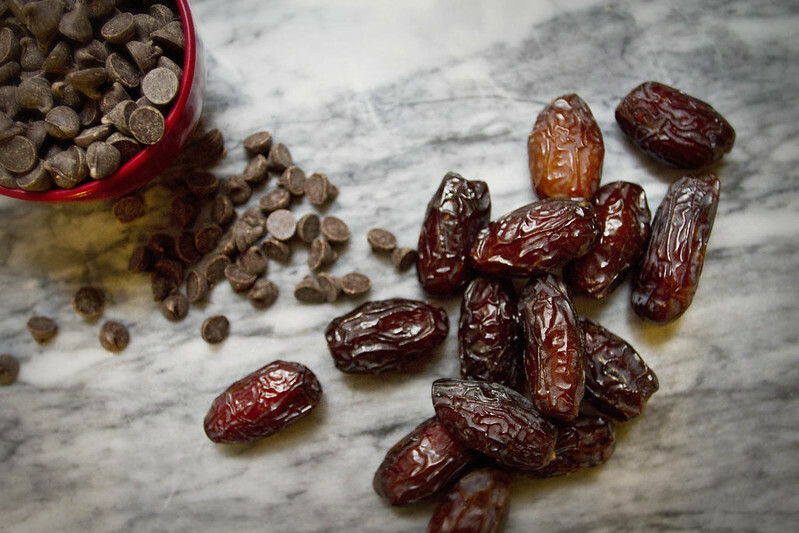 I really liked the combination of the dates and dark chocolate, I chopped my dates fairly rough so there would be noticeable bits of date in the final product and I was glad I did. The dates were like soft pockets of caramel in the deep chocolate cake. 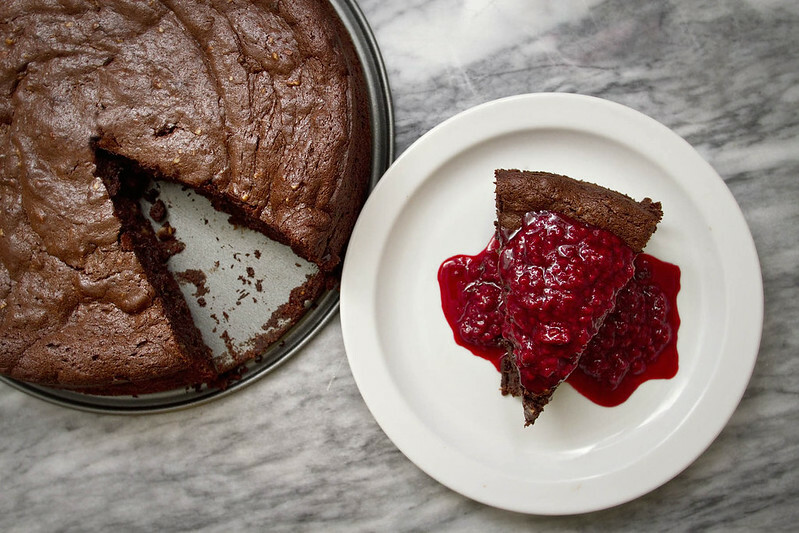 I generally find raspberries make a fantastic addition to anything chocolate, and I thought they would go nicely with the dates too, but to give them a slightly darker and more complex edge, I added the maple syrup. I used frozen raspberries, so you should feel free to do the same. The sauce turned out lovely, and I bet it would be pretty great on vanilla ice cream too, if you have any leftover. 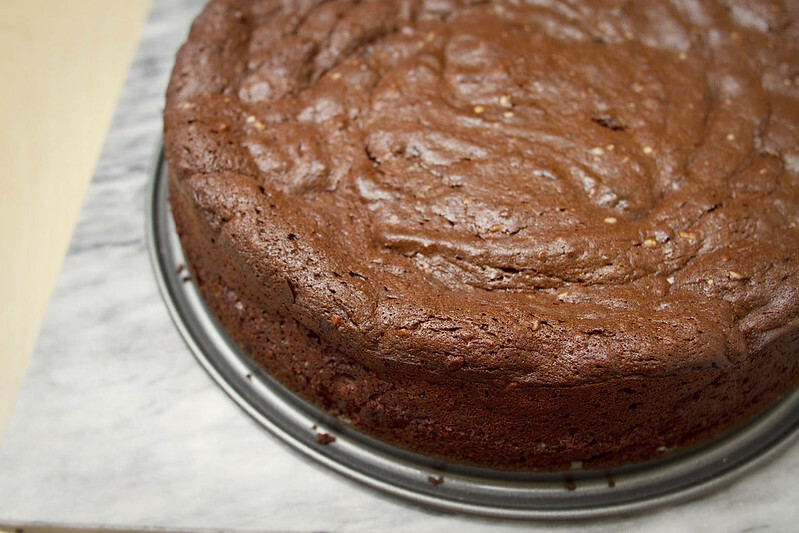 This cake filled my apartment with an amazing chocolate-toffee-fruit smell that lingered long after it finished baking, I imagine making this cake just before people arrive to a party would make your guests think you're a culinary genius. I think I'll be making this cake again next week for a dinner party we're having, at which I hope to make a copy cat honey baked ham. But first I have to find an affordable unglazed spiral cut ham in Manhattan. If anyone has any secret ham sources, let me know. This cake would be lovely at the end of a holiday dinner, or any kind of dinner party. 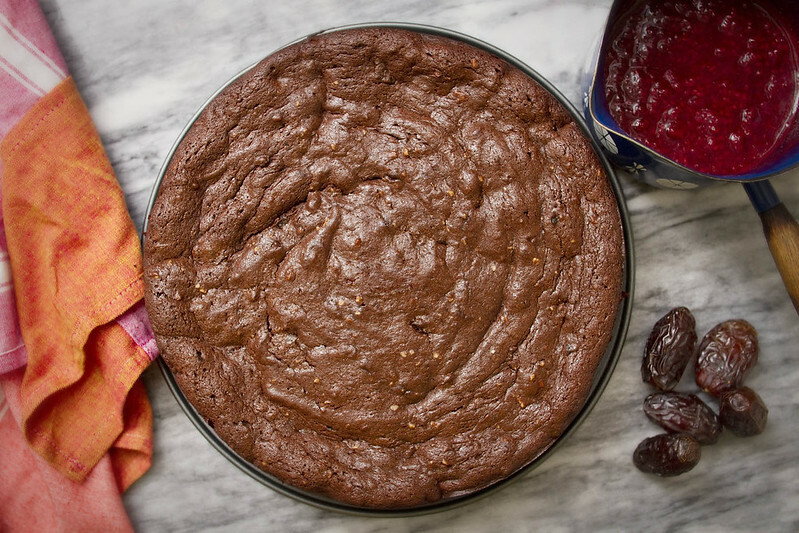 It's easy enough to make alongside other cooking, doesn't have to be eaten immediately after baking, and tastes like chocolate heaven. 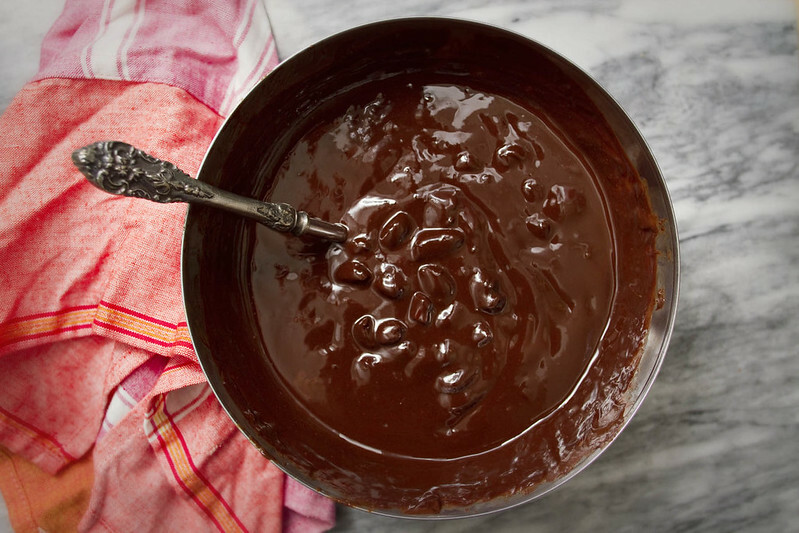 Place your chopped dates, chocolate, maple syrup, and butter in a heat proof bowl or a double boiler, and place over lightly simmering water. Mix occasionally until chocolate and butter have melted and everything is mixed. Set aside to cool. 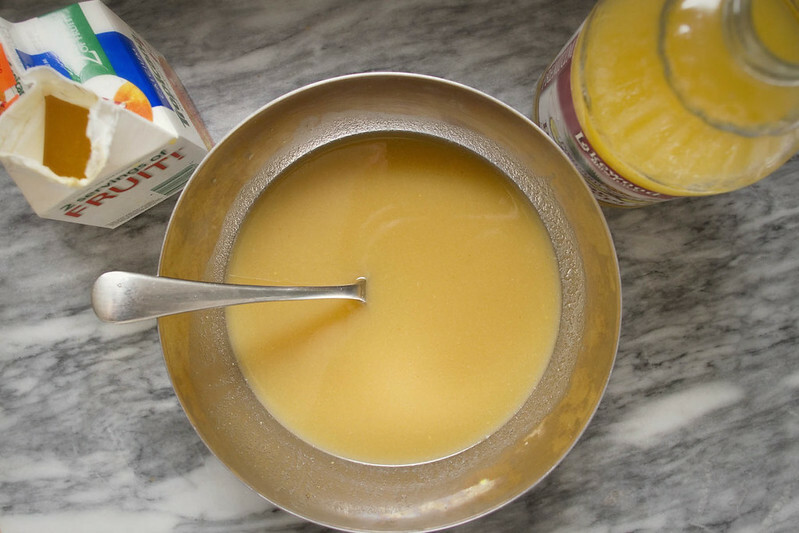 Combine egg yolks, sugar, cinnamon, and almond extract in the bowl of a stand mixer, or in a medium sized bowl and mix until creamy and pale, 2-3 minutes. When the chocolate mixture is fairly cool stir in the egg yolk mixture until fully combined. Mix in the ground almonds. In a separate bowl using a whisk or electric mixture whisk the egg whites until stiff peaks form. 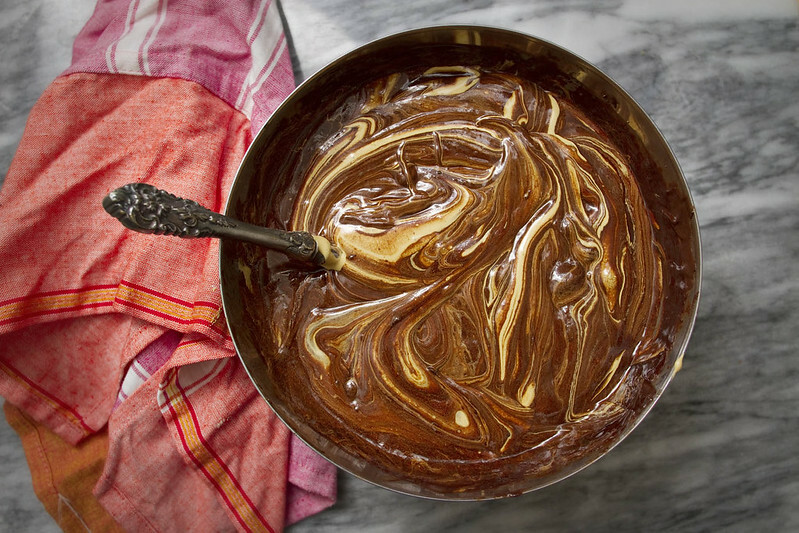 Fold the egg whites into the batter until fully combined, but do not overmix. Be gentle with the egg whites. Pour batter into pan and bake 40-45 minutes until a toothpick inserted into the middle comes out clean. 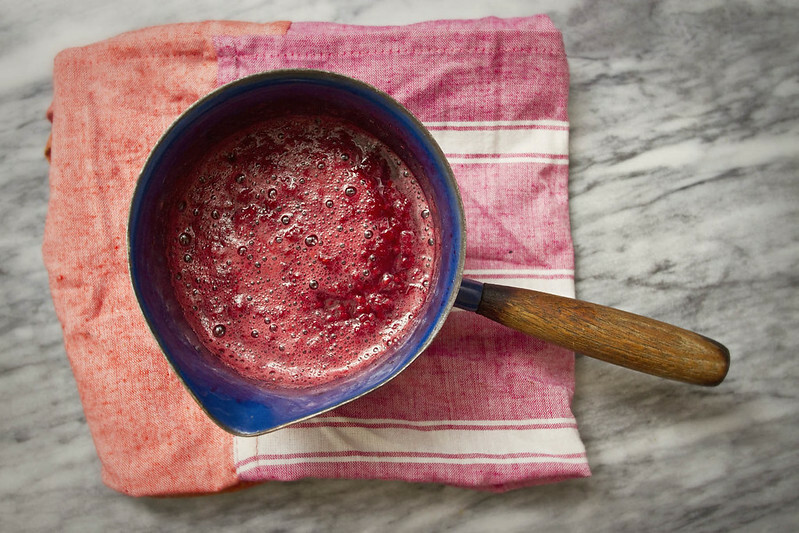 While the cake bakes, combine the raspberries and maple syrup in a small sauce pan, cook over low heat for 8-12 minutes, until a sauce forms. Set aside to cool a bit. 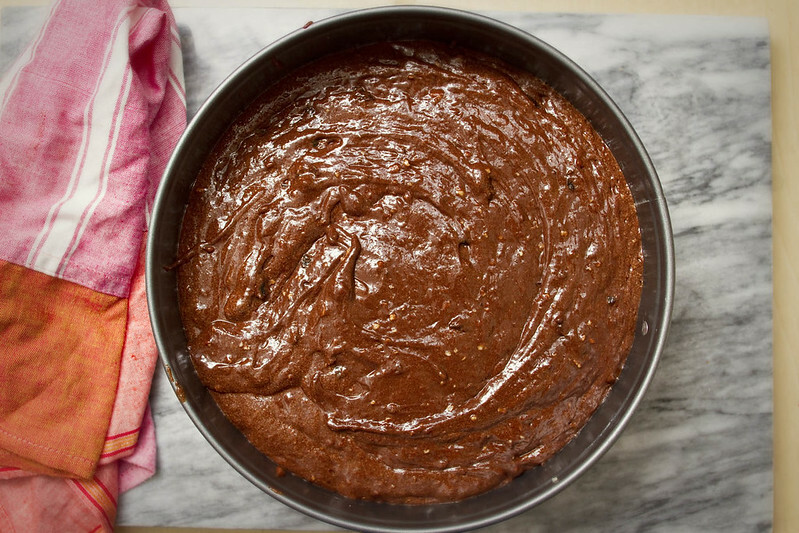 Allow cake to cool at least 10 minutes before removing from pan. 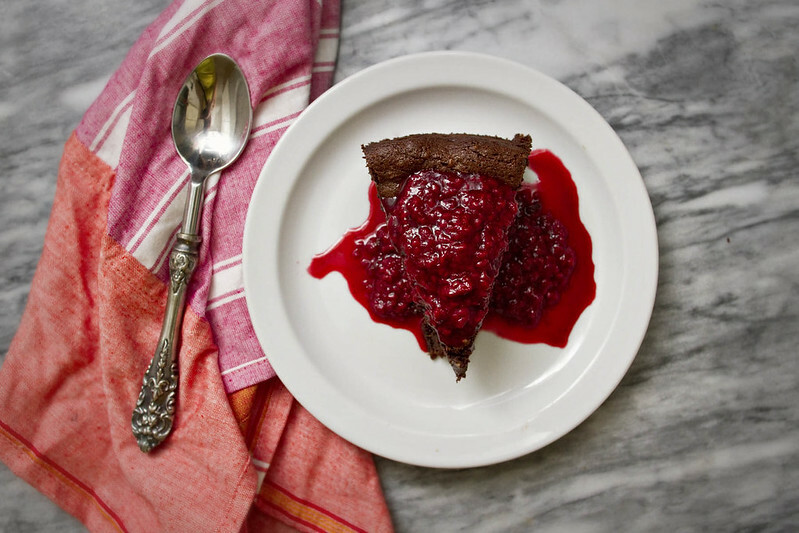 Serve warm with raspberry sauce poured over each slice. *Brown sugar can be substituted for coconut sugar, if needed. When you have family holiday gatherings, does your family have dishes they serve each year? What about whole meals that are replicated annually? Do you have the same meal every year, or mix it up? On my fathers side of the family we have an annual Christmas Eve gathering at my aunts house, and I'm pretty sure everyone in attendance looks forward to the same thing every year. Mini Pizzas, Hanky Pankies, Aunt Mare's Squares, Party Pizzas- When I reached out on Facebook to get the "proper" name of the beloved dish my cousins came back with a myriad of options. Hanky Pankies seems to be the most popular on Google. Whatever they're called, my family loves them. Many heaping plates are served on every Christmas eve, and emptied nearly as quickly as my cousin can bring them from the kitchen. I'm pretty certain a Christmas eve party without them would be a sad affair. When I decided to make Hanky Pankies for S, who quite frankly thought they sounded unappealing, I knew I didn't want to use velveeta, which all the recipes I could find called for. I'm just not into processed cheese product. Make no mistake- I have enjoyed many, many hanky pankies with velveeta in them, but when I'm doing the cooking, there are some products I avoid, like processed cheese. I also knew I wanted to use Chorizo. I love chorizo, in this recipe you want to use the raw chorizo one would buy at a butcher over the smoked, already fully cooked type that comes prepackaged. Either type will do, but the raw one will mix with the ground beef better. 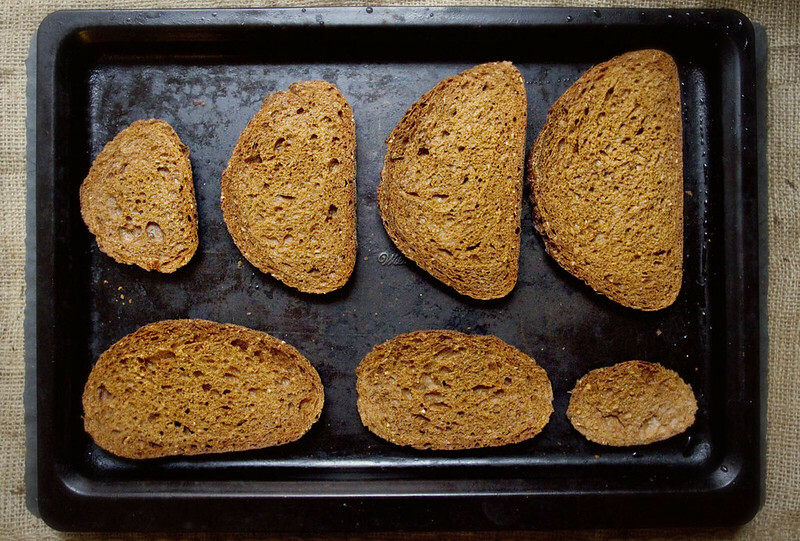 Usually Hanky Pankies call for those tiny square loves of pumpernickel or rye bread, but much searching of my supermarket's bread, bakery, and cracker sections produced no such tiny square bread, so I used regular pumpernickel. 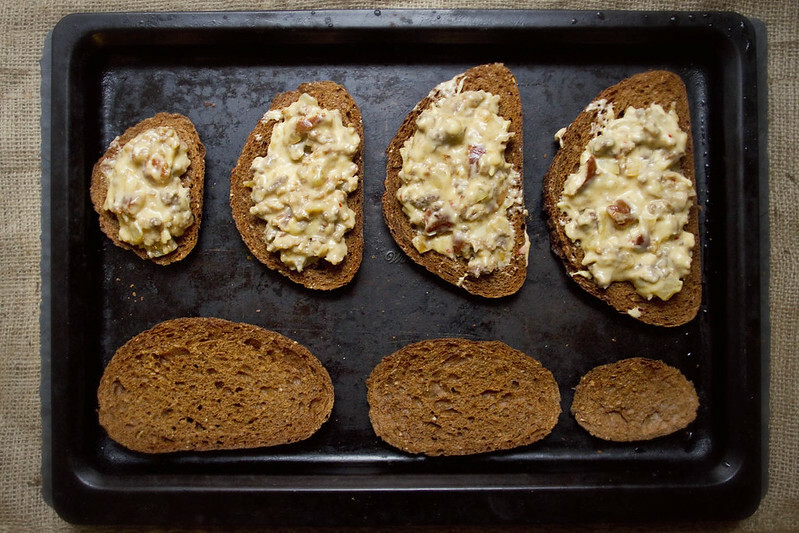 It turned out great, I totally recommend doing this in all Hanky Panky recipes, it toasted it really well and was very luxurious and fluffy compared to the tiny square breads. However, big bread meant cutting my larger pieces in half. If I was serving these as an appetizer I might have cut them even smaller, but S and I ate these for lunch (which was awesome and I may do it again today). 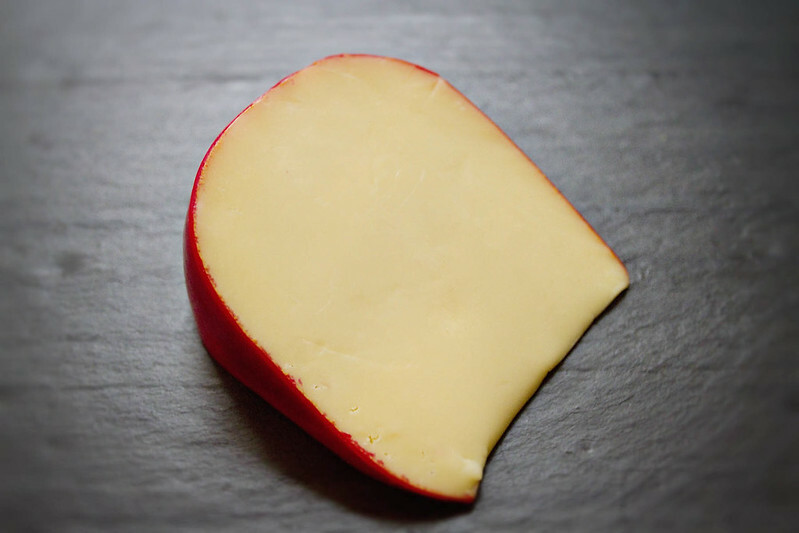 The final product turned out to be a more flavorful, slightly spicy, very creamy version of the tradition Hanky Panky. The cheese sauce was melty and creamy and a bit nutty, while the chorizo was spicy and bright, and the bread crisped up enough to be sturdy but was still fluffy and just soft enough. These are a delight. 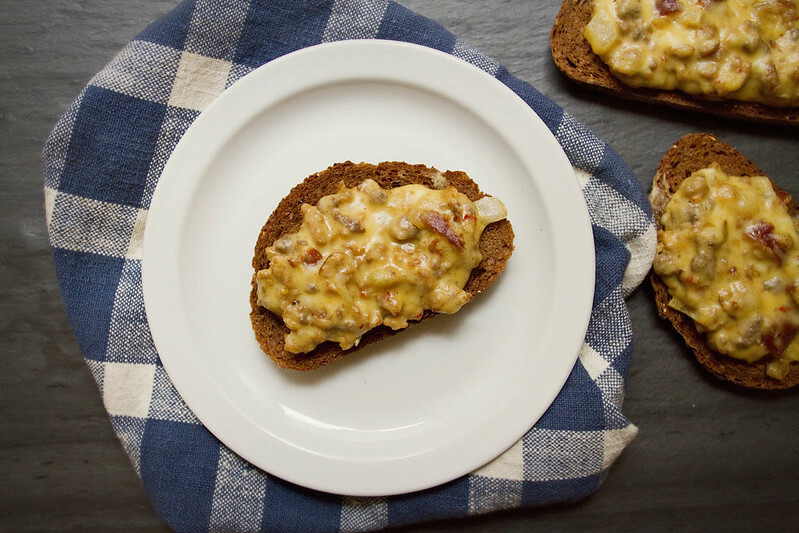 Creamy and spicy and a bit crispy, they make a great finger food for a cocktail party, or tasty appetizer at a holiday dinner party. 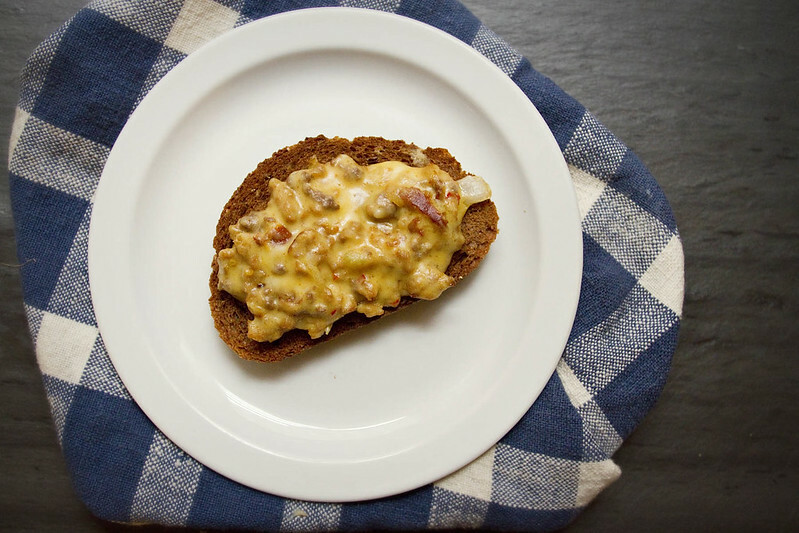 This recipe makes enough for 1 loaf of bread, and the trickiest part is not eating them all before you serve them. 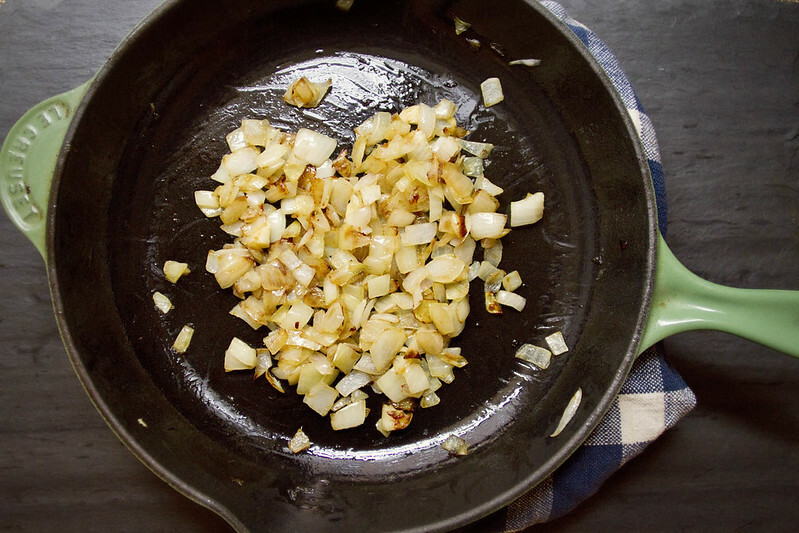 Chop onions fairly small, add olive oil to skillet and cook onions over low heat until caramelized, 6-8 minutes. Remove and set aside. If your chorizo came in links, use a knife to split the casing and remove the meat. 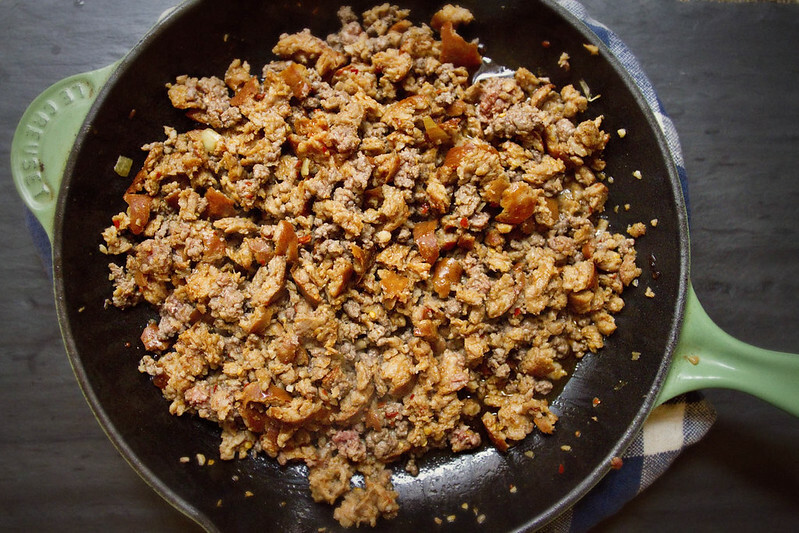 Crumble chorizo and ground beef together, then add to the skillet you caramelized the onions in, add some black pepper, and turn heat to medium. Brown beef and chorizo, then drain the fat. Set skillet aside. In a large sauce pan or pot, add the butter and heat over low, once butter melts, sprinkle the flour over the butter while whisking, to produce a roux. Cook your roux, while whisking, for a few moments to let it thicken. Then gradually add the milk and cook, stirring constantly, until the sauce thickens, about 2-3 minutes. Slowly add a small amount of the sauce to the beaten egg, while constantly whisking. Be careful, you don't want to cook the egg, I pour mine in slowly one spoonful at a time, from fairly high above the egg bowl, while whisking. Once you've added about 1/4 Cup of the sauce to the egg, add the egg mixture to the pan of sauce, while mixing. This will prevent the egg from cooking when it's added to the hot sauce. 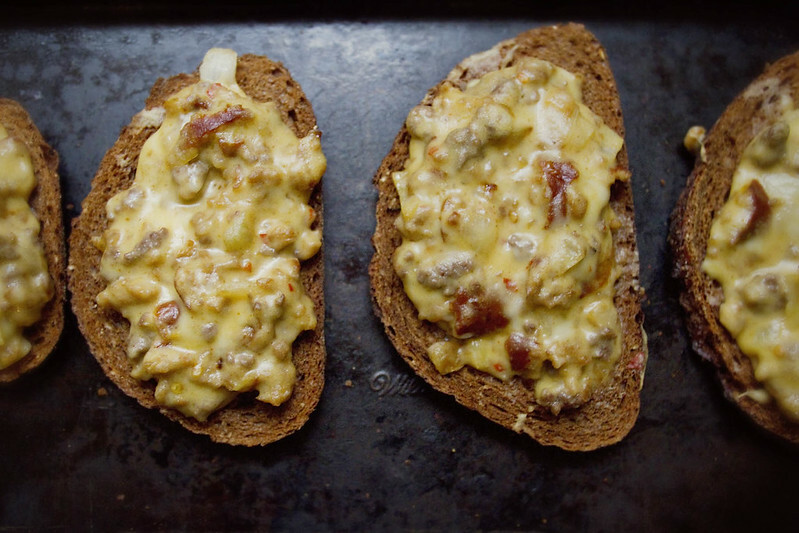 Return the sauce to a very low heat and gradually add the grated gouda, while stirring in a zig zag pattern to prevent the cheese from balling. 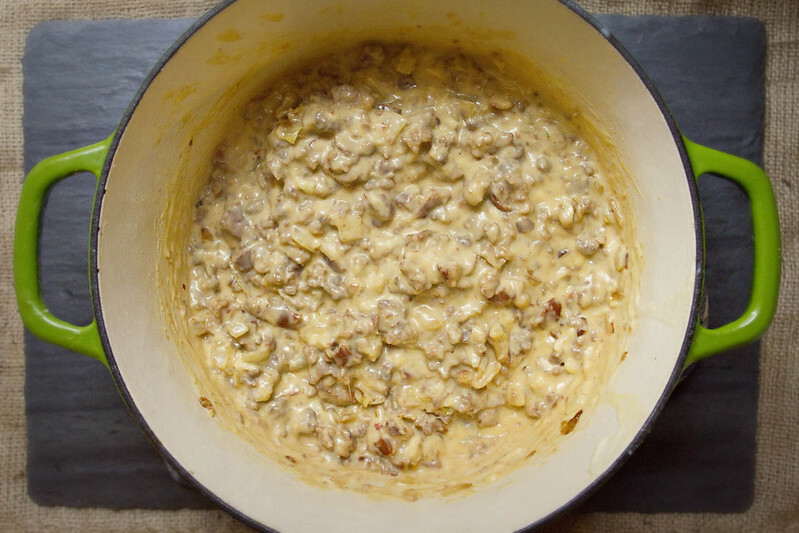 Once all the cheese is melted, mix in the 2 dashes Worchestershire sauce, then add the meat and onions to the pot and mix well to combine. 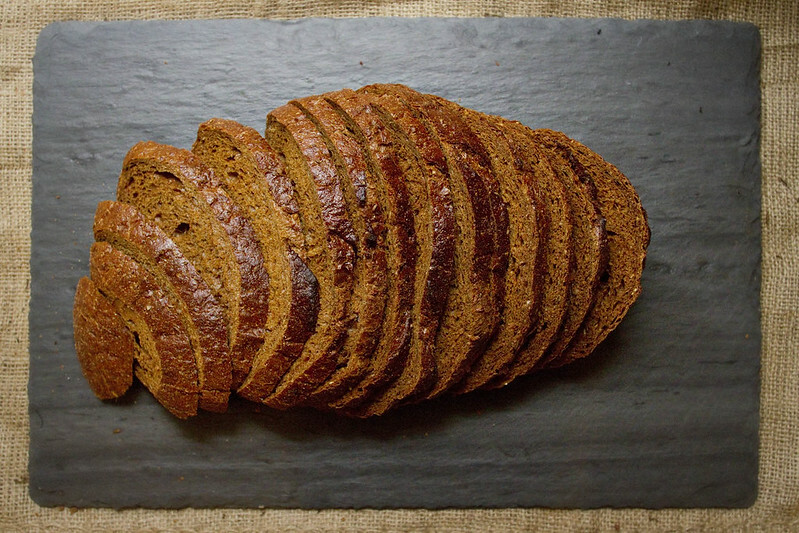 Cut the larger slices of pumpernickel in half, or cut them all to your desired size, then divide the meat/cheese mixture up between the slices. 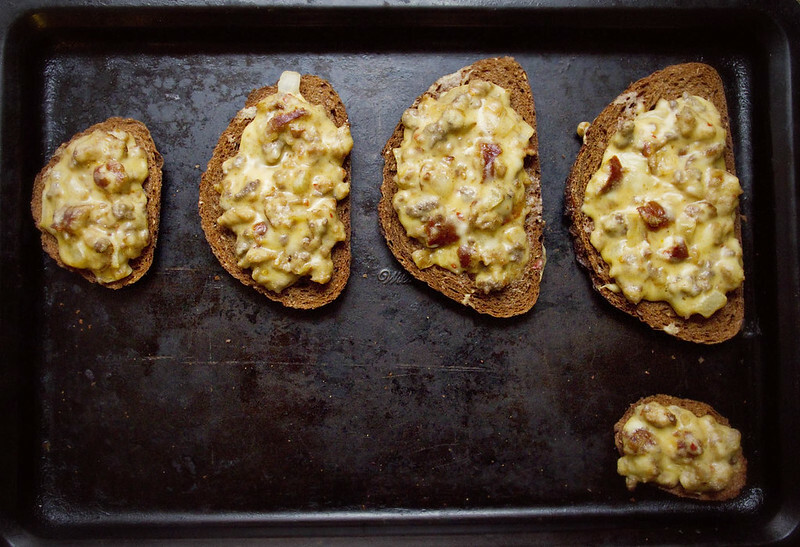 Bake for 10-12 minutes, until cheese is bubbly and bread is toasty. Serve warm. These cookies are so tasty. They are not the best example of my photography, or dough making skills, but they are incredibly easy, super tasty, and will be prettier when you make them because you won't be using several day old whole wheat dough. These may just be the easiest fancy cookie ever. If you use store bought dough they become even simpler. If you consider store bought dough as 1 ingredient, then they only have four. Dough, jam, a bit of water, and a sprinkling of sugar. 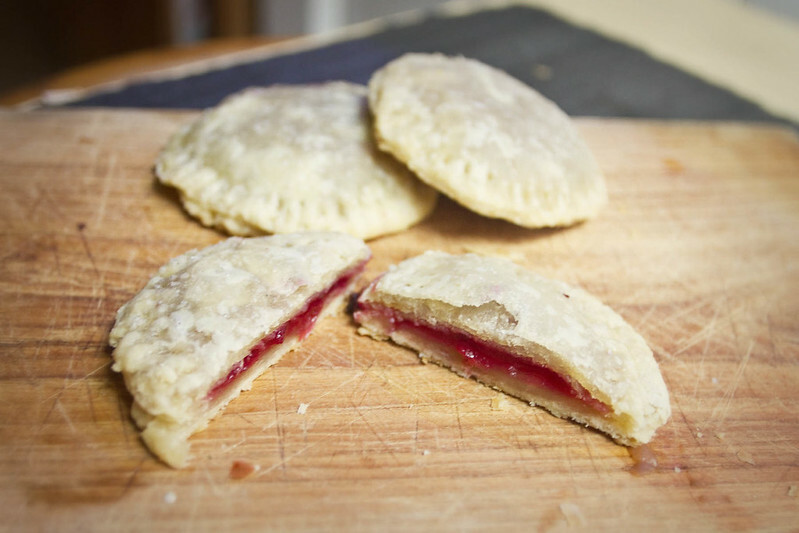 They're equally fantastic with applesauce or jam, but my favorite filling was cranberry sauce, so if you have any leftover from the holidays I highly recommend making these with cranberry sauce. I also made some with my slow cooked maple applesauce and those were incredible too. The jam ones were also great. I imagine any number of fillings would be lovely in these, lemon curd, orange marmalade, maybe even dulce de leche would be lovely. If you want to get fancy and give the pies a more golden-brown hue then brush the tops with the egg wash before baking. If you're more interested in keeping the recipe super-ultra-crazy easy, then don't bother with the eggs. They turn out very tasty either way. While editing these photos today I realized if you cut these into squares instead they could also make great homemade poptarts. Oh geez, I'm going to have to try that soon. 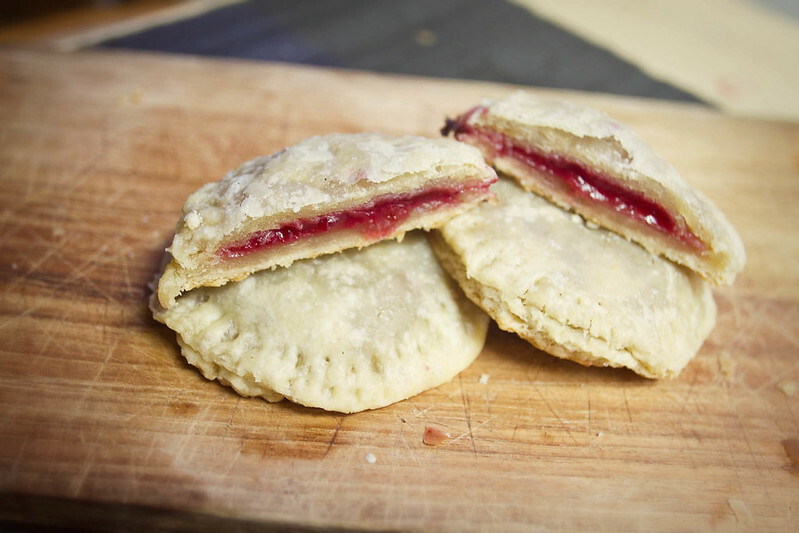 I made these from leftover pie dough and cranberry sauce from Thanksgiving, we've also had leftover sandwiches, I slow cooked the bones into broth and tomorrow I shall make a huge pot of Turkey soup to finish it off. So, how was your Thanksgiving? What did you make? Did you do anything interesting with your leftovers? I want to hear all about it! 1 Recipe of Pie Dough, or 1 package store bought roll out pie dough. 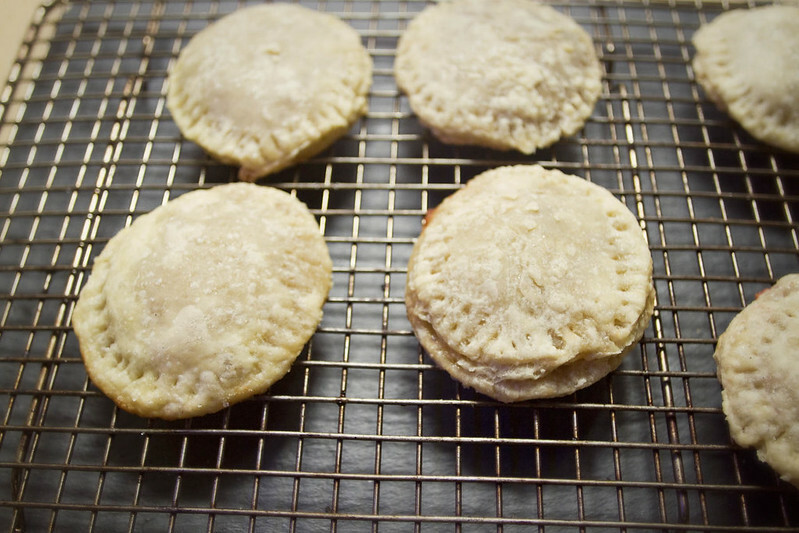 If you use use 1 roll out pie shell (or 1/2 a recipe of dough), you'll end up with about 7-8 pie cookies. 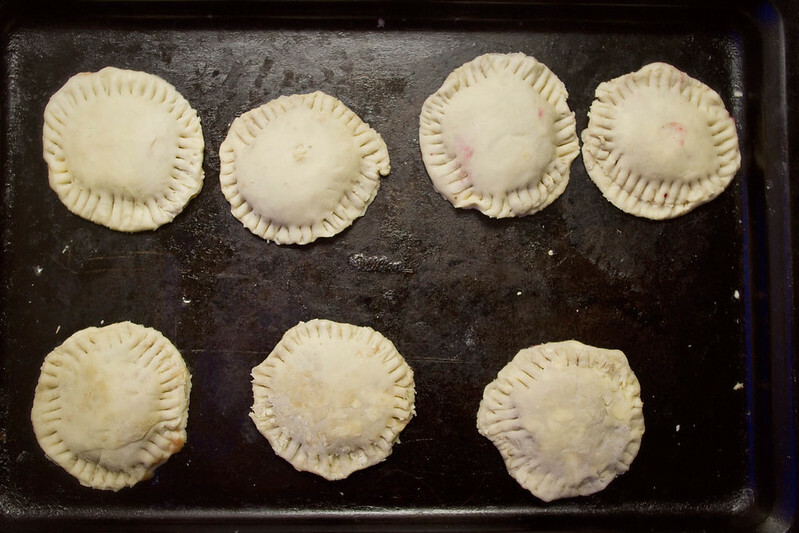 Using both pie shells, or a whole recipe, will produce about 16 cookies. 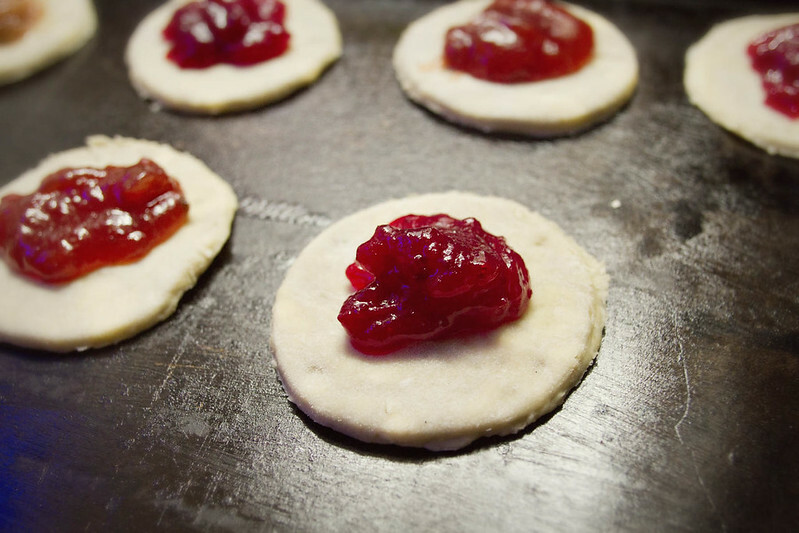 Roll out your pie dough, or unroll your pre-made dough, and using a jam jar, round cup, or biscuit cutter, cut as many circles in the dough as possible. Try to get an even number, since it takes two to make a pie. Repeat on second dough if using. 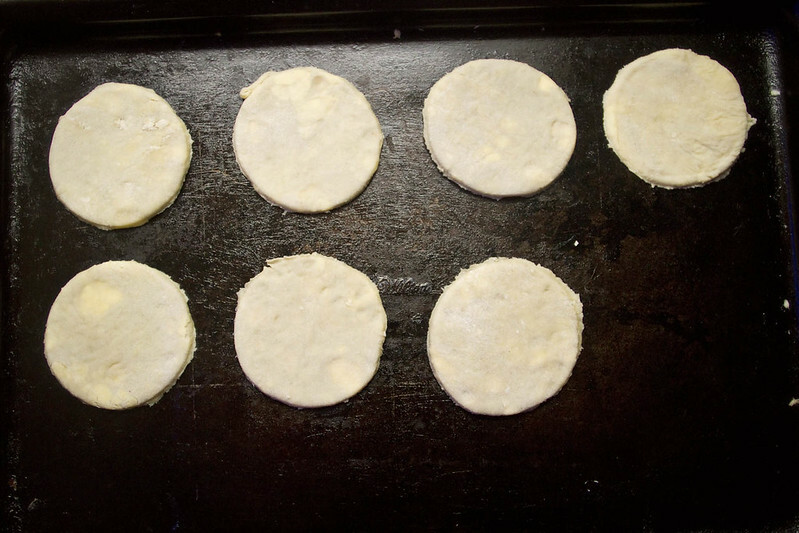 Grease a cookie sheet and arrange 1/2 the dough circles on the pan. 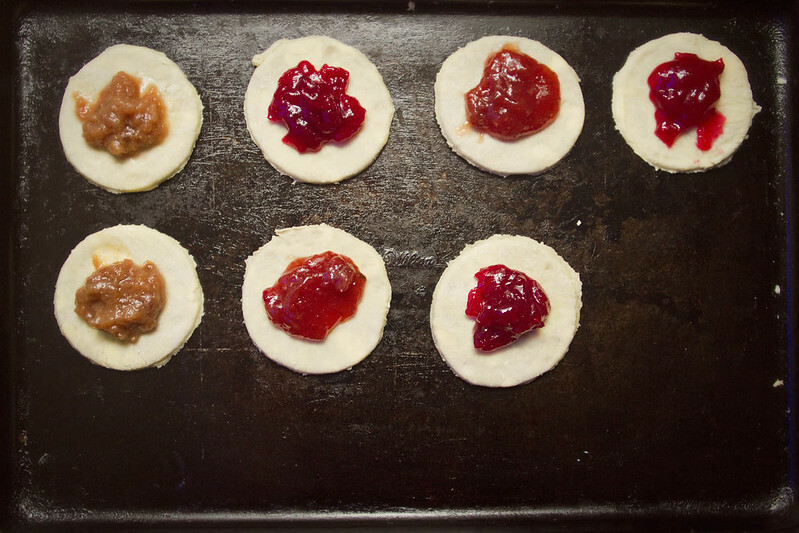 Add about 1 tbsp jam, cranberry sauce, or apple sauce to the center of each dough circle, adjusting the amount so they are not overfull. See my photos above for reference. 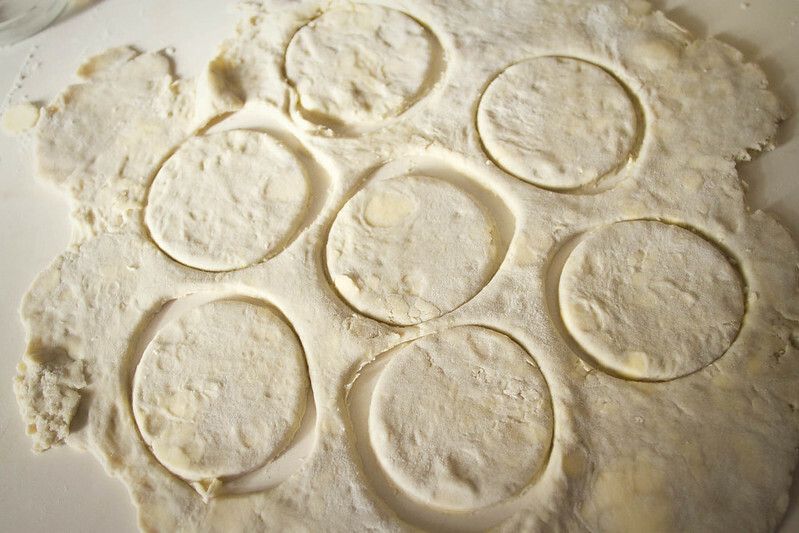 Using fingers or a basting brush, brush the edges of a dough circle with a little bit of water, then add the top dough circle and use your fingers to gently squeeze them shut. Then use fork tines to press a cute little pattern around the edges. I recommend you entirely assemble each pie before moving on to the next. Placing all the dough lids then sealing them all will get messy. If using the egg wash, whisk together the egg and 1 tsp water in a small bowl, and using a basting brush, brush the top of each pie. Sprinkle each pie with sugar- coarse if possible. Bake for 12-15 minutes, until pies are golden and dough looks crisp. Let chill on a wire rack about 5 minutes before eating to avoid burning yourself on the filling.